Albert Camus (pronounced Kam-oo) was a heavy thinking writer known for delving into existential issues — the meaning of life, the search for personal and spiritual values, and the perhaps inevitable insignificance or even absurdity of trying to make sense of it all. His fiction put readers and characters into difficult situations, with unflinching prose conveying the quandary and question of how humans react to such ordinary dilemmas. In his first and most famous novel, L'Étranger (The Stranger, a/k/a The Outsider), the protagonist/narrator, Mersault, wanders through life more as an observer than a participant, and seems to have no emotional investment in his own existence, much the way life happens to many of us in the real world. His mother's death means little to him, and his looming marriage seems to be scheduled not due to love but because marriage is what society expects. Mersault is drawn into conflict with an Arab man, whom he kills without particularly understanding (or even caring) why. As these and further events swirl beyond the main character's control, he only engages with his conscience and soul when it is too late, in his prison cell. The synopsis might sound depressing, and the novel is more depressing than it sounds. No less challenging but perhaps more optimistic despite its macabre plot line, Le Peste (The Plague) relates the story of a small town is besieged by the bubonic plague, with numerous characters asking themselves, what is the proper response? Widely taken as an allegory for war-time Nazi occupation, the novel explores how different people try different tactics, leaving the reader to judge what might be moral or possible in such a difficult setting. Camus faced such decisions himself during World War II — he was deemed physically unfit for military service, having spent several stints in sanitariums for recurring bouts of tuberculosis, but he became deeply involved in the French resistance. His father was killed in World War I, and the news gave his mother a stroke, leaving her partially deaf and with speech slurred. He was raised in poverty, and only educated beyond grade school because his brilliance was obvious enough, even in youth, to earn a partial scholarship to the University of Algiers. The remainder of his tuition was earned through back-door purchase and resale of auto parts, clerical work, and employment as a private tutor, all of which informed the common-person characters which populate his books and plays. His was a friend of Jean-Paul Sartre, until Sartre wrote a dismissive review of L'Homme Révolté (The Rebel: An Essay on Man in Revolt), his classic non-fiction treatise on revolution. 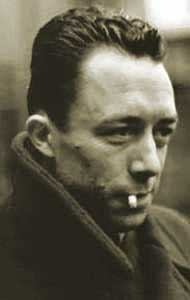 Camus won the Nobel Prize for Literature in 1957, and died in an auto wreck barely two years later at the age of 46. Active in the French and Algerian Communist Parties.